The SleePee-Time Bed® is a unique new product specifically designed to help older dogs, and those suffering from urinary incontinence to get a good night's sleep. It can also be used simply as a cool, comfortable sleeping surface for any pet. The bed, with its innovative patented construction, cuddles the dog, while urine flows down to a sturdy tray underneath. Both your dog's skin and your carpet stay drier, making for an all-around happier household! 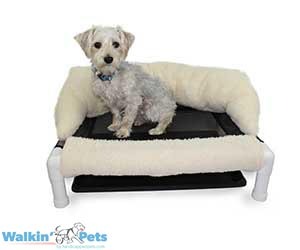 Your dog sleeps on a bed of special vinyl-coated polyester fiber mesh dog bed. This unique fabric has a wider gauge mesh than ordinary PVC pipe dog beds, so urine flows easily through the mesh to the protective pan waiting below. With a SleePee Time Bed®, your dog won't be sleeping in a puddle! The SleePee Time Bed® hugs your dog with luxurious "lambs fleece" bolsters and a pillow for warmth and security, but the unique design makes sure the cuddly "lambs fleece" stays clean and dry. Finally, a good night's sleep! It's a cinch to clean up after your pet with the SleePee Time® system - just spray the bed with any non-abrasive household cleaner and wipe! The bolsters stay clean and dry, but can easily be removed for machine washing and drying as needed. The pan keeps the floor or carpet clean, too. Air circulates under your pet with SleePee Time's® open mesh sleeping surface to promote comfort and evaporation. Your dog stays drier, which is better for the skin! The SleePee Time Bed® is low to the ground, so it's easy to step in or out of - Perfect for dogs suffering from orthopedic problems. The SleePee Time Bed® comes with the bed, bolsters and urine pan, medium size (good for dogs up to 25 pounds), large size (for dogs up to the size of a lab or golden retriever). The bed is easy to assemble. PVC piping is threaded through the mesh and inserted into elbows and tees. Medium For dogs up to 25 pounds 21" x 27"
or golden retriever 27" x 39"